Is this an insight on the Narrative Paradox? 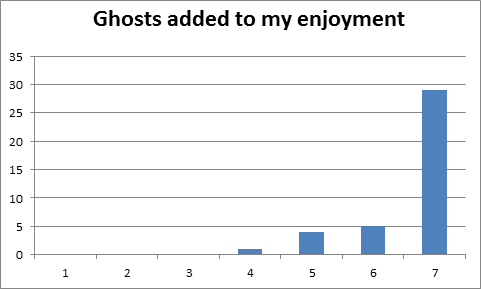 I’ve been analysing the data collected for my evaluation of Ghosts in the Garden. Yesterday I sent my preliminary observations to the guys who created it, and by the end of today I hope to have completed the first draft of my full report. If everyone approves I’ll share it all here in future. 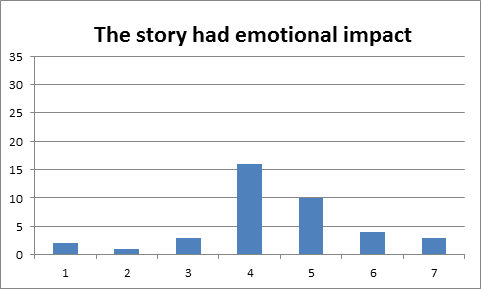 Most users were non-committal about emotional engagement, and some did not agree that the story had any emotional impact. Asking people to rate their emotional response is according to many, a futile task, and there are likely better ways to measure it, but allow me to indulge myself for a moment. If I can assume that the story was indeed not as emotionally engaging as it might be, I might ask myself “why not”? 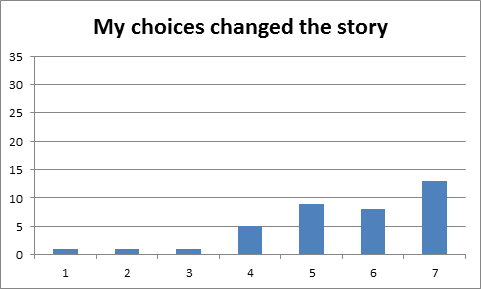 A number of people agreed that the choices they made changed the story, but more were less convinced. So my next overriding question is, did confidence that they were changing the story affect users’ emotional engagement? I think I can do a cut of the data to find that out, but the sample size is too small to be really confident in what it might show. Given what I’ve been uncovering about the story structures of the video games I’ve played though, I beginning to wonder if there’s any value to this sort of interactivity. For me, Skyrim, with its wider story structure has been a lot less emotionally involving then either Red Dead Redemption or Dear Esther, both of which take the player towards one single, inevitable, ending. And then there’s the Narrative Paradox. I wonder whether, rather than trying to construct a number of possible endings, Splash and Ripple (the creators of Ghosts in the Garden) might have better used their time, and the interactive nature of the device, to offer visitors a choice of points-of-view on one single story. And if they had done so, would that have made the narrative stronger, and more emotionally compelling? Fresh from my excitement after mapping the narrative structure of Red Dead Redemption in Prezi, was inspired to do the same with Skyrim. Half a day into that I realised I was mad, and modified my ambitions. So this presentation ignores the Radiant quests and deals just with the “scripted” ones. Any gamers out there will note that it doesn’t include any of the downloadable content either. It’s interesting to note how linear all the stories are, while being allowed to wander around the virtual space means the player can leave one narrative and start another very easily, creating an illusion of branching narratives. Though I guess it isn’t an illusion, it is rather your character’s unique narrative. But you play prefer to use this link. I think that will do. I may even include it in my Rochester presentation. If so, I’m going to have to do Dear Esther and (gulp) Skyrim too. I participated on the panel for a web discussion on museums and mobile technology today. It was an interesting experience. Because it uses the website’s standard comments system, you find yourself getting into a number of interesting conversations as the same time, and perhaps not quite satisfyingly concluding any one. Though that said, it’s given me a number of contacts I can finish conversations with at a later date. I’m not sure how easy it is to read after the event. I feel I want to go through it an write up a report – but I’m not going to do that. If you want have a look at it, here’s the link. Last week, for my holiday in Cornwall, I took some “hard” reading with me, but I was determined to have some holiday reading too. Having mentioned Neal Stephenson in a previous post, I was reminded that I hadn’t ever picked up one of his more recent books, Reamde. Shopping around, it was pretty cheap on Kindle so I downloaded it, and took it with me. IF THERE WERE going to be K’Sheteriae and Dwinn, and if Skeletor and Don Donald and their acolytes were going to clog the publishing industry’s distribution channels with works of fiction detailing their historical exploits going back thousands of years, then it was necessary for those two races to be distinct in what archaeologists would call their material culture: their clothing, architecture, decorative arts, and so on. Accordingly Corporation 9592 had hired artists and architects and musicians and costume designers to create those material cultures consistent with the “bible” of T’Rain as laid down by Skeletor and Don Donald. Reamde follows the adventures around one Richard Forthrast, co-founder of a company that produces a wildly successful MMORPG called T’Rain. The game is based on (and portrayed as a competitor to) World of Warcraft but the attention to detail in material culture is reminiscent of Skyrim, which has of course inspired more than one “ludic archaeologist“. I got quite excited as the opening chapters progressed. The last Stephenson book I read, Anathem taught me a lot about mathatics and quantum theory, and I thought he might blow my mind about game design too. Sadly (though entertainingly) the novel became an extended transcontinental shootout involving the various members of Forthrast family, a couple of chinese teenagers, a Hungarian hacker, a Russian “security consultant”, a British MI6 agent and a Welsh muslim terrorist. Because Corporation 9592, at bottom, didn’t make anything in the way that a steel mill did. And it didn’t even really sell anything in the sense that, say, Amazon.com did. It just extracted cash flow from the players’ desire to own virtual goods that could confer status on their fictional characters as they ran around T’Rain acting out greater or lesser parts in a story. And they all suspected, though they couldn’t really prove, that a good story was as foundational to that business as, say, a blast furnace was to a steel mill. Which is why this fictional company has a department called Narrative Dynamics. But his leading character does think ludically too: the novel recounts how they come up with the idea that the core “Medieval Armed Combat” mechanic could be used to help with monotonous real-world jobs. This is like an idea my wife had mentioned a couple of years back. The example in the book was airport security, but it made me laugh when I saw the story about Fraxinus. The other thing that I liked about T’Rain (and something that I miss in Skyrim) was the vassal system – players were not simply lone adventurers, but could recruit (or be recruited into) a gang, warband, household or army, in something like a pyramid selling scheme, all of which feels like a more realistic medieval style world than one in which everyone is equal. The novel recounts how this eventually divides the players into two factions, not the artificial Good and Evil factions invented by the games creators, but the Forces of Brightness (Manga inspired players who dressed their characters in lurid colours) and the Earthtone Coalition (more eurocentric gamers who enjoyed more Tolkienesque fantasy). These two factions of course starting to produce material cultures that built on the created archaeology of the world, but which were something entirely new and unplanned. A fun read, even if not quite the escape I was hoping for. The week before last, I wrote about Annabel Cohen‘s paper on music in video games, and mentioned Karen Collins of Gamesound.com. Collins has written a great deal on games and sound. Her 2007 paper, An Introduction to the Participatory and Non-Linear Aspects of Video Games Audio, from the book Essays on Sound and Vision, seemed a good place to start. Collins begins by suggesting the subtle difference between the terms “interactive,” “adaptive” and “dynamic”. In her useful set of distinctions “interactive” sounds or music are those that respond to a particular action from the player, and each time the player repeats the action the sound is exactly the same. Citing Whitmore (2003) she argues that “Adaptive” sounds and music are those that respond, not to the actions of the player, but rather to changes occurring in the game (or the game’s world) itself. So “an example is Super Mario Brothers, where the music plays at a steady tempo until the time begins to run out, at which point the tempo doubles.” She goes on go describe “dynamic” audio as being being interactive and/or adaptive. She also explores the various uses for sound and music in games. She has read Cohen, obviously and so her list is very similar. She quotes Cohen in relation to masking real-world environmental distractions, and in the distinction between the mood-inducing and communicative uses of music. She points out though, that the non-linear nature of game sound means that its more difficult to predict the emotional effects of music (and other sounds). In film, she states, its possible for sounds to have unintended emotional consequences – a director wanting to inform that audience that there is a dog nearby will tell the sound designer to include a dog barking out of shot, but the audience will being their own additional meaning to that sound, based on their previous experiences (which she calls supplementary connotation) . But in games, she argues, where sounds are triggered and combined in relatively unpredictable sequences by player actions, even more additional means are possible. This is something that was made very clear while I played both Red Dead Redemption and Skyrim. Red Dead Redemption would often alert me to an upcoming threat by weaving a more urgent, oppressive tune into the background music. Skyrim took a different approach, the music for Skyrim doesn’t work as hard, but while my cat-creature was sneaking around underground tunnel systems, I was often alerted to potential threats by my enemies muttering to themselves as I approached blind corners. Collins points out that these sorts of cues have occasioned a changing listening style from passive to active listening, among gamers. Sometimes though, as Collins points out, games are created that put musical choice directly into the players’ hands. The Grand Theft Auto series gives the player a choice of in-car radio stations to listen too, so that their particular tastes are better catered for. Though they weren’t around at the time of Collin’s writing many iOS and other mobile games have a feature by which the player can turn off game music and even other game sound effects if the so choose, to listen to their own library of music, stored on the device. She even cites the game Vib Ribbon, or the Sony Playstation, which allows the player to load their own music from CDs, and the music then changes the gameplay according the structure of the music the player has loaded. Collins also discusses the challenges that composers face when writing for games. For a start, Collins points out that “in many games it is unlikely that the player will hear the entire song but instead may hear the first opening segment repeatedly, particularly as they try to learn a new level.” (Though she also points out that many games designers are leaning to include what one composer calls a “bored now switch.” After a number of repeats of the same loop of music, the sound fades to silence, which both informs the player that they should have completed this section by now, and stops them getting annoyed and frustrated by the repetition. The other main problem is that of transition between different loops (or cues, as she calls them). “Early games tended towards direct splicing and abrupt cutting between cues, though this can feel very jarring on the player.” Even cross-fading two tracks can feel abrupt if it has to be done quickly enough to keep up with game play. So composers have started to write “hundreds of cue fragments for a game, to reduce transition time and to enhance flexibility in music.” This is the approach taken in Red Dead Redemption, where as I move my character around the landscape, individual loops fade in and out according to where I am and what is happening, but layered together they feel (most of the time) like one cohesive bit of music. Multiplayer games present another problem. “If a game is designed to change cues when a player’s health score reaches a certain critical level, what happens when there are two players, and one has full health and the other is critical?” she asks. Just before she completes the paper, she has some thoughts on the perception of time too. I’ve noticed a sort of “movie-time” effect in Skyrim, which presents a challenge for my real-world cultural spaces. So I think I might need to look at that in more detail. I’ve been on holiday (and heritage free, spending my time bodyboarding, cycling, sea-kayaking and, lest anyone thinks that all sounds too healthy, over-eating in Cornwall) so this blog has been quiet for a week. But will I was away, a colleague shared a link to a very interesting blog post about London museums creating Spotify playlists to accompany exhibitions. The writer is conflicted about whether these should be listened too while actually at the exhibition, or before or after a visit. But there’s something interesting here about using music to set the mood, either prior to or at a visit, or when reflecting upon it afterwards. I’ve been thinking about music again, and staring into the pit of unknown unknowns that is my non-existent understanding of music, except as a casual listener. I know music affects me, and I’ve how important an emotional trigger in the games I’ve been playing for my studies, but I don’t know how or why, and right now I’m wishing I had a degree in Cognitive Psychology to help me understand. (The certificate would sit alongside the degrees in Computer Science, English and History that I don’t have). Its such a huge subject, but I came across this paper, by Annabel Cohen, which though quite old (1998) I’ve found to be a useful primer. It also led me to the Gamessound website of Dr Karen Collins, Canada Research Chair in Interactive Audio at the Games Institute, the University of Waterloo, Ontario, who has written lots of juicy papers which start where Cohen left off, and are (the clue’s in the URL, a lot more games specific). Masking – Just as music was played in the first movie theaters, partly to mask the sound of the projector, so music in new media can be used to mask “distractions produced by the multimedia machinery (hum of disk drive, fan, motor etc) or sounds made by people, as multimedia often occurs in social or public environments.” Apparently lower tones mask higher ones, and listeners filter out incoherent sounds in preference for coherent (musical) sounds . Of course the downside is music can mask speech too when that speech is part of the intended presentation. Direction of attention – Cohen has obviously done some experimental research on this function, broadly speaking, patterns in the music can correlate to patterns in the visuals, directing the attention of the user. Communication of meaning – Cohen says “It is important to distinguish between mood induction and communication of meaning by music. Mood induction changes how one is feeling while communication of meaning simply conveys information.” Yet, when she discusses communication of meaning, she uses examples of “emotional meaning: “sadness is conveyed by slow pace, falling contour, low pitch and the minor mode.” I take from this that her nice distinction is between music that makes the user sad, and music that tells the user “this is a sad event” without changing the user’s mood. Hmmm … I’ll have to think about that. A cue for memory – This is another one that I’ve written about before. Music can trigger a user’s memories from a past event that’s totally unrelated to the new media presentation, if they’ve coincidentally heard the particular piece before, but the effect is more controllable with music especially written for the presentation. The musical term for this (from opera, arguably the first multimedia presentations) is leitmotiv. The power of the music to invoke memories or “prepare the mind for a type of cognitive activity” is well recognized in advertising and sonic brands such as those created for Intel and Nokia. Arousal and focal attention – “it is a simple fact that when there music, more of the brain is active” Cohen says (without reference). She does on to argue that with more of the brain active, the user is more able to filter out the peripheries of the apparatus running a new media presentation, and concentrate on the diagesis of the presentation, what Pinchbeck calls presence. On the other hand, she admits that some think excess stimulation pulls focus away from central vision and towards the periphery. Aesthetics – Here we come to what my colleagues report is the biggest issue with using music in interpretation. Cohen says “music is an art form and its presence enhances every situation in much the same way that a beautiful environment enhances the experience of activities within it.” But she admits that aesthetics is subjective, and “music that is not appealing can disturb the user.” Not only that, but some individuals may find all background music difficult to cope with. So that’s my new media music 101. Next time I’ll look at what Collins has to add. I’ve spent the last couple of days trying to get my head around just what it is that makes me so adamant that historical RPGs are somehow important to archaeological discourse. Something inside me is quite sure that gaming is this huge, untapped resource for knowledge-making. A lot of this pondering has consisted of me trawling through online forums and trying to figure out what kind of interactions people are having with the past during their gameplay. I’m far from figuring out just what it is that makes people engage with the past in videogames (or if they are even aware of doing so) but I’m definitely getting to grips with the kinds of interactions people are having. Obviously, these interactions are multiple, but I’ll summarise the jist of it below.